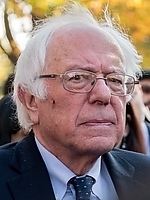 Info Bernard ("Bernie") Sanders has been a member of the United States House of Representatives since 1991, representing the state of Vermont as an Independent Socialist. He is currently running for the Senate, in the seat vacated by James Jeffords. He is the only independent member of the House, and is one of very few self-described socialists elected to federal office in the United States in recent times. The son of a Polish immigrant, Sanders was born in New York and educated at Brooklyn College and the University of Chicago. He settled in Vermont in 1964. He was a member of the anti-Vietnam War Liberty Union Party, and in the 1970s was a candidate for state-wide office four times. In 1981 Sanders ran for Mayor of Burlington, the largest city in Vermont. He defeated the six-term Democratic incumbent by 12 votes. Increasingly popular because of his successful revitalization of the downtown area, he won three more terms as Mayor of Burlington, defeating Democratic and Republican candidates. Sanders lost his bid for the office of Governor of Vermont in 1986 and a race to become Vermont's member of the U.S. House of Representatives in 1988. But in 1990 he ran again for the House, this time successfully. Sanders has held his seat for six successive terms, defeating both Democratic and Republican candidates, and becoming the longest-serving independent member of the House. In 1992 he took 57.8% of the vote to his Republican and Democratic opponents' respective 30.9% and 7.9% of the vote. In 1994, the year of a resounding mid-term Republican victory, he took 49.9% to his Republican opponent's 46.6%. In 1996 he took 55.2% to his Republican and Democratic opponents' respective 32.6% and 9.3%. In 1998, he trounced his Republican opponent 63.4% to 32.9%. In 2000, he took 69.2% to his Republican and Democratic opponents' respective 18.3% and 5.3%. In 2002, he took 64.3% to his Republican opponent's 32.3%. Most recently, in 2004, Sanders took 68.8% to his Republican opponent's 24.6% and Democratic opponent's 7.3%. The House Republican leadership has chosen to treat Sanders as a de facto member of the Democratic delegation. Although relations between Sanders and House Democratic leadership have not always been smooth, Howard Dean in a May 2005 interview indicated that he considered Sanders an ally who voted with House Democrats. Sanders endorsed President Bill Clinton in 1992 and 1996 and Al Gore in 2000. Sanders is a member, along with many of his left-leaning Democratic colleagues, of the House Progressive Caucus, which he co-founded and chaired for its first eight years. Sanders opposed the 2003 invasion of Iraq and voted against the resolution authorizing the use of force in the fall of 2002. He later joined almost all of his colleagues in voting for a non-binding resolution expressing support for U.S. troops at the outset of the invasion, although he gave a floor speech criticizing the partisan nature of the resolution and blasting the Bush administration's actions in the run-up to the war. On the domestic front, Sanders supports universal health care and opposes foreign trade agreements which, he says, deprive American workers of their jobs while exploiting foreign workers in sweat-shop factories. An amendment he offered in 2005 to limit provisions giving the government power to obtain individuals' library and book-buying records passed the House by a signficant bi-partisan majority, giving President Bush a rare and major legislative defeat and marking the first rejection of any section of the USA PATRIOT Act. His lifetime legislative score from the AFL-CIO is 100%. In contrast, as of 2004, he has a grade of "F" from the National Rifle Association. With the retirement of Independent Senator Jim Jeffords, Sanders has announced his intention to seek Jefford's U.S. Senate seat in the 2006 election cycle. Howard Dean, DNC chairperson has indicated that he will not put a candidate up against Sanders, paving the way for an easier victory against any Republican opposition. Senate Minority Leader Harry Reid and Senators Hillary Clinton (NY) and Charles Schumer (NY) have also announced their support for Sanders. According to the leftist magazine In These Times, "Judging from his popularity, Sanders' election is all but assured. If he takes office, he will become the Senate's most progressive member." 03/10/2020 WA US President - D Primary ?? ?